From the lads behind Upstairs at The Ten Bells, The Clove Club is their latest and first permanent London fixture. Located in the historic Shoreditch Town Hall, they have fitted out a front bar and a separate dining room. It’s ambitious, youthful and everyone’s talking about it. A much larger dining room and open kitchen makes the experience a little less intimate than their Ten Bells gaff, nevertheless the open space, high ceilings, wooden tables and blue tiles give an almost boarding school diner feel that works. The acoustics need a little tweaking, or maybe I am just getting old! An eight course set menu is presented which ticks all the boxes, seasonal, interesting and sounds delicious. It’s so nice to just sit down and be fed. No tricky menu decisions, no food envy at the table, just a continuous flow of deliciously executed food morsels. 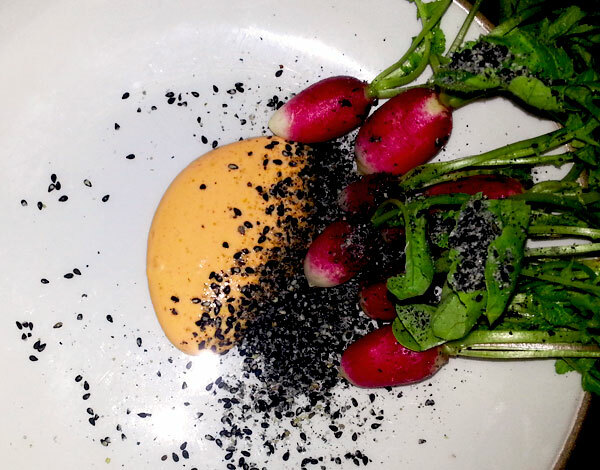 Kicking off with the prettiest of pink radishes with a chilli mayo dipping and black sesame. Crunchy and with peppery leaves they were rather delightful. A signature dish followed, Colonel Sanders step aside. 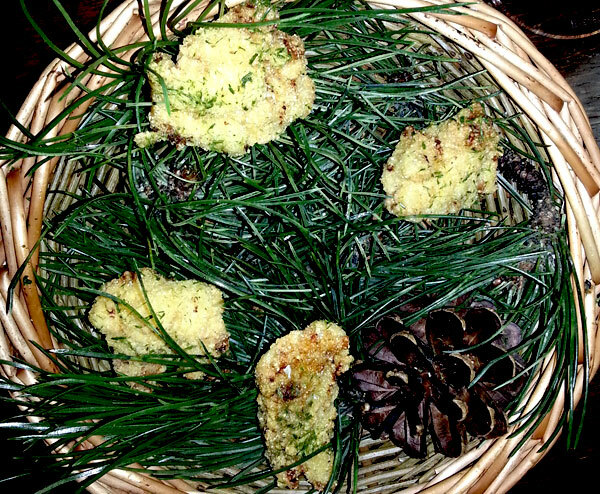 Crispy battered buttermilk chicken with secret (pine salt) herbs and spices. It was just a shame there was only one heavenly piece each. Last of the sharing starters was thin lashings of smoked duck ham. Something I hadn’t ever come across but would like to meet again. Beautifully plated, sashimi mackerel with the whitest of turnip slithers and of course what every dish is missing, pickled rhubarb! I could have done with a little more pickle but perhaps I am a little greedy! My pick of the mains, the squid was perfectly cooked and absolutely divine with the tarragon puree. Fragrant, salty and damn delicious. And green radishes…where can I source these, so pretty. Mmmm beef. I think this dish silenced the table. 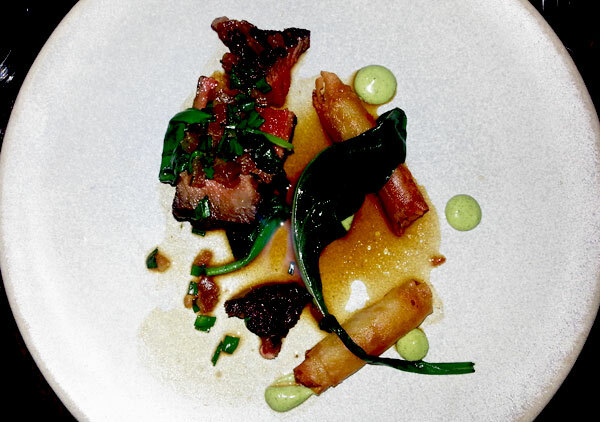 A juicy portion of beef with very pungent wild garlic dollops and crispy potato cigars. Excuse me whilst I wipe the drool from my keyboard. This is honestly the best desert I have eaten in a long time. It was totally unexpected and so fricking good. 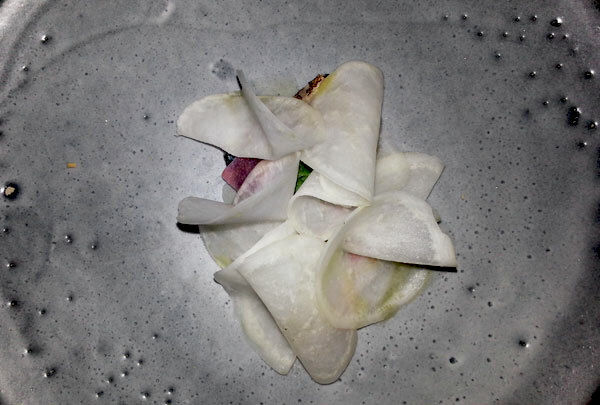 A wild fennel granita gave it a very vegetative flavour, the dish on a whole was quite savoury. 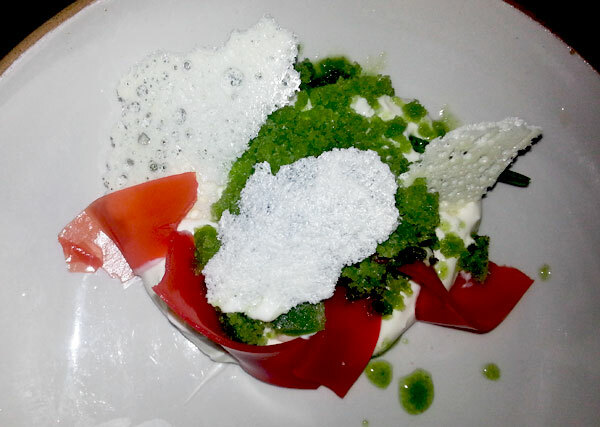 The sheep’s milk mousse was creamy and sublime and the crispy milk wafers added a textural crunch. Blood orange ribbons were quite fun and with segments of the fruit tucked in giving the dish a tart squeeze. It really was amazing. Could even be served as a starter. And finally a second desert. Who doesn’t love a menu with two deserts! A salty caramel ice cream with barley and oats. Again an interesting mix of sweet and savoury which totally worked. Eight courses, all beautifully executed and seriously tasty. The experience doesn’t leave you feeling as though you need to be rolled out of the restaurant but pleasantly content and reminiscent of all the delicious goodness you have just consumed. And at £47 I think it is amazing value. So good! 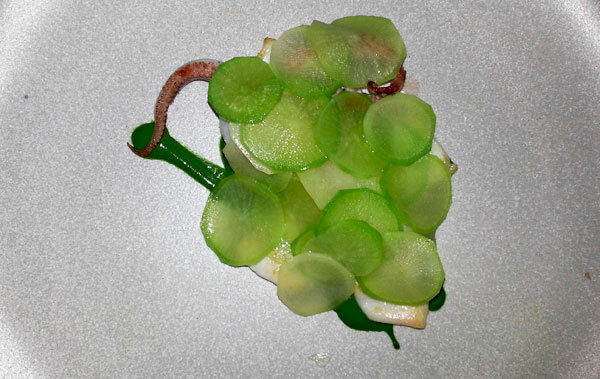 The squid with tarragon and green radishes was my favourite. Or maybe the beef. Too many good choices.